In 2014 a family, who live in Kempten, approached the then vicar about baptising their two children. They asked that the baptism to be done in Kempten for the sake of the other family activities that often go with a baptism: visitors from out town, house guests, lunch after church, etc. Through the cooperation of the Old Catholic congregation in Kempten we had a very nice church to use. As the word spread that we would have a service in Kempten, other members of the Ulm congregation who live in and near the Allgäu pushed that we should make it a general service to see how many Anglican people there are in the area. An invitation was put out on FaceBook, and the locals helped pass it on too. We had six of us from Stuttgart, two others from Ulm came down on the train. The Baptismal family had 12 in total. But others from the area brought our total to 34 persons, with several others who offered their apology for not being able to attend on that particular Sunday,… but nevertheless interested in future services. The second service held in Kempten was a Carol Service for Christmas. 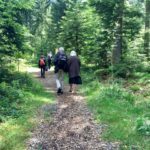 On 21st May 2017 members of the mission of Kempten followed in the footsteps of St Francis of Assisi, walking a path of contemplation. After the service everyone enjoyed a picnic.